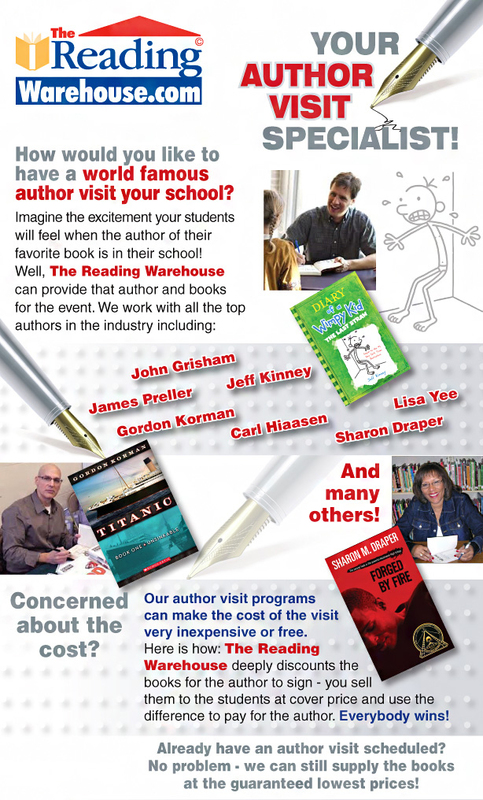 The Reading Warehouse will attempt to schedule the requested author for your school. The school is responsible for paying the author's fee. Most author books are sold to the school from TRW at 31% off retail. You will sell the books at retail price to the students. Selling the books to students at full retail will offset the cost of the visit but may not be enough to cover the entire fee. Publicizing the event throughout the community and a thorough promotion will increase the chances of a free or low cost visit. Pre-selling books for the visit is the best way to generate excitement and to ensure a good response from the community. TRW will provide with a list of available books from the author in a PDF flyer format. The flyers will need to be printed and should be sent out to the students at least twice prior to the event. You should place your order with TRW for the books no later than 14 days before the event. The books will be delivered to your school no later than 3 days before the author visit. You will take orders for these books the day of the author visit. TRW will send you book plates for the author to sign for those students wishing to purchase books the day of the event. These book plates can then be affixed to the books ordered after the author leaves. The Reading Warehouse will ship out all in stock books ordered within 24 hours of the close of the event. Do you have a set date you want to have an Author visit? If not what month would you want one? What city and state are you in ? How much money do you have set aside for an Author event? Many national Authors can cost from $4,000 to $10,000. What are the grade levels at your school? Do you have a certain grade level Levels you are wanting this Author event for?